Controversial Vlogging couple Natalie Tewa and ex-boyfriend Rnaze Mukibi were spotted reconciling with the socialite Vera Sidika as the intermediary. Sidika had revealed that they had been friends with Rnaze for the past eight years and she was the right person to intervene after going through a public break up with popular singer Otile Brown. They reunited at a club in Nairobi as they celebrated Mukibi’s 30th birthday. Through her Instagram story posts, the two were seen cordially talking out their differences after a much-publicized break up last week. Last week the model who has since taken a liking for photography has been pulled to the limelight after a break up with a pretty lass and Youtube star Natalie Tewa. A video emerged of what might have transpired between the two love birds who have both accused each other of cheating. In the video, Natalie is seen banging on the door after being put out by Mukibi. She gets hysterical as neighbors and the security try to implore her to stop banging on the door. 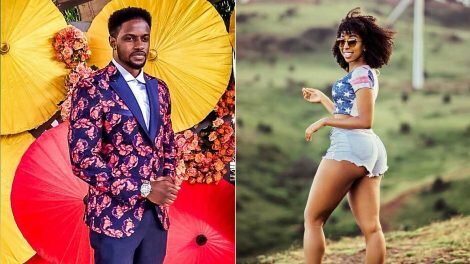 Rnaze, officially known as Moses Mukibi then surprised netizens after a much-publicized breakup from Natalie Tewa, by deleting his Instagram page. Rnaze trended on Twitter last week for breaking up with the YouTube star Natalie Tewa, deleted his page after first getting rid of traces of their memories on all his social media platforms. He is also noted to have deleted all YouTube content that he had worked on with his then pretty lass, Ms. Tewa. people in love always make up after a break up. given the chance, would you get back together with your ex? Plane Flying From Kitale To JKIA Goes Missing!? !